Survive as head of state in the free browser strategy game Supremacy 1914 in the time of World War One. Supremacy 1914 – as the ruler of Finland. 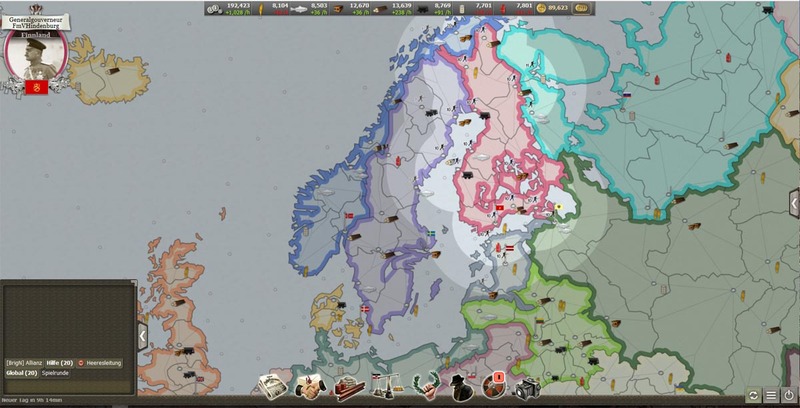 In the standard setup of the free strategy and browser game Supremacy 1914 you have to fight as one of about 30 rulers during the period from 1914 to 1918 in World War One for the control over the territories around the Atlantic Ocean: from North America to the Urals and from the North Cape to North Africa. For reasons of game balancing, the states are not corresponding to the historical situation (although there are also special games in Europe with the borders of 1914), but are at the beginning of the four to six weeks game period equally strong and have 10 provincial cities with 10 infantry units (20 for absolute newcomers in Supremacy 1914). Each provincial capital city has a different raw material resource and with increasing duration of the game can be built more buildings. It is important to generate a surplus or at least a balanced stock of food (cereals and fish), building materials (steel and wood) and energy (coal, oil, gas). Supremacy 1914 – city map. At the beginning we can construct a Recruiting Office (priority), barracks, workshop or a fortress. With these resources, the own army and the population must be adequately supplied, otherwise the moral is falling. Also construction materials for construction of buildings (barracks, factories, forts, ports and railways) are required. The railway consumes in turn additionally coal in the operation, but more will be produced in the province as well as units can be quickly transported there. In the factories can be military equipment produced such as armored vehicles, artillery, railway guns, tanks, heavy tanks, warships, submarines, cruisers, balloons, fighter and bombers. This also requires raw materials for the production as well as fuel during use. Not all resources of a kind can be equally used for all purposes, so that a certain economy and planning ahead for the construction of buildings is essential. If certain raw materials are missing, they can be purchased on the market. In return, you can also sell goods there from which you produce a surplus. Sometimes, however, the own demand for raw materials can only be covered through the conquest of a neighbor. For these cases alliances and wars are possible. So it is important to observe the other states and respond accordingly. Unfortunately, many players however give up very quickly, which is why a relative strong AI could take over their place. 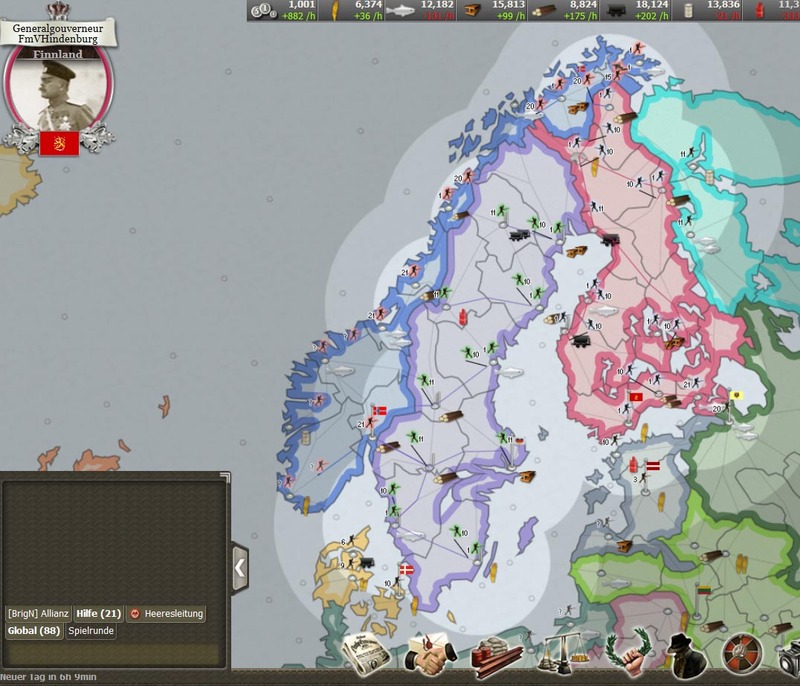 Our country Finland was attacked by Norway (red units), but we could ally ourselves with Sweden (green units). 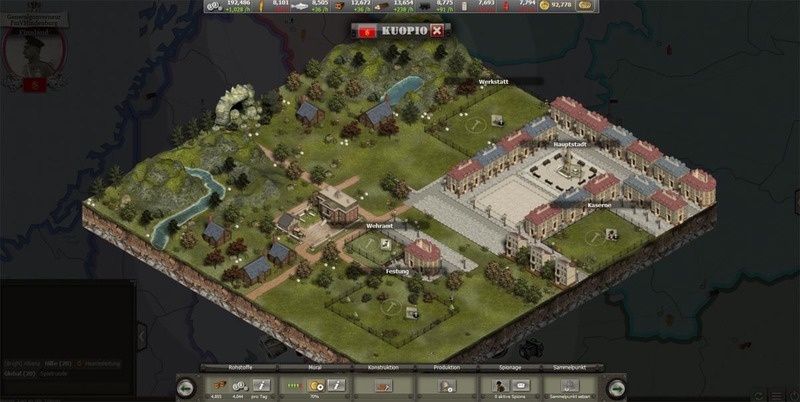 Nevertheless, in the course of the game arise usually a challenging and interesting match between the remaining top players, since they also have a strong resource and industrial base in their conquered and developed provinces. The whole game is running 24 hours a day in real-time, what not to say, one has all the time to be online inside the game, but however a regular status check is of great advantage to be able to respond quickly to threats and challenges. Supremacy 1914 is basically once free, but by the additional purchase of the in-game currency ‘gold marks’ this can compensate for disadvantages (for example, by constructions accelerations or moral compensations), which e.g. is useful for players who do not have constantly time and / or on-line access (but potentially more real income, because they have a job). If now should come an outcry, so sometimes must always again be remembered that the so-called free-to-play titles still require software development and need server maintenance, which, of course, requires some certain profit to do. At the moment there are a total of 6 different maps to explore and it is possible to start your own, special scenarios with individual rules modifications or in private groups.